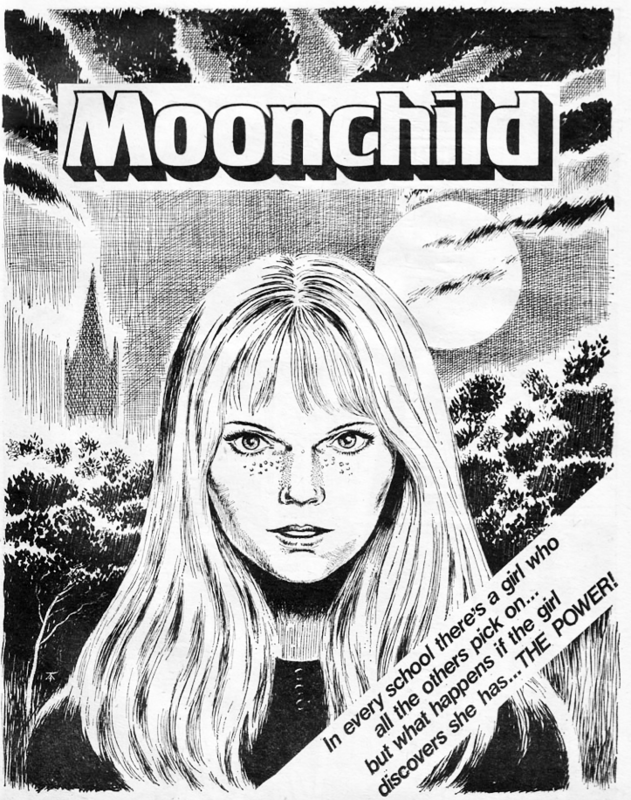 Many of the sessions were not specifically relevant to girls comics and the other subjects covered in this blog, so I won’t go into them here. They did however trigger some thoughts that I am still musing on, which are more relevant to this audience, I think and hope. One of the first talks I went to was called “How Do We Know What Time It Is In Comics?”, by Paul Fisher Davies. 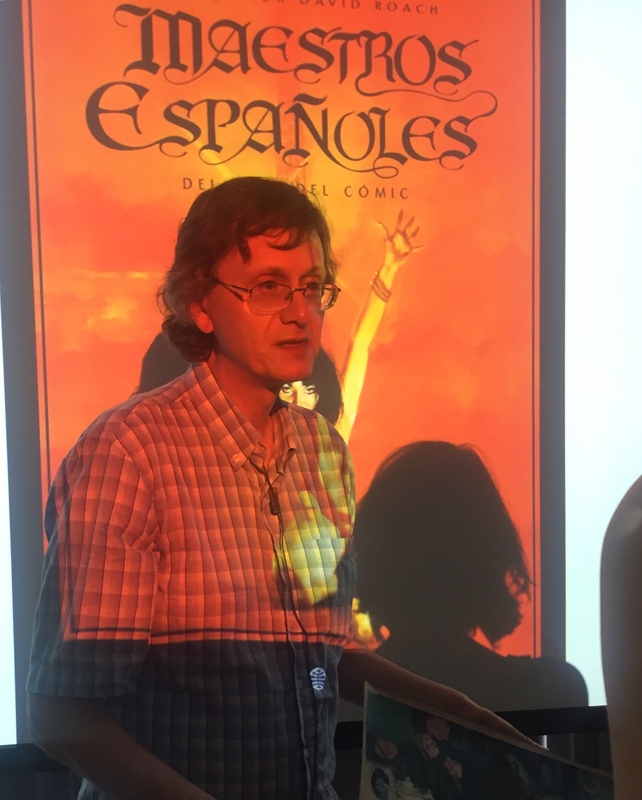 He talked about the idea that as comics readers, we assume that the action happening in front of us is necessarily happening ‘now’, unless it is specifically indicated otherwise. One of the examples he showed us of different times being depicted on a page was in “Watchmen”, where Dr Manhattan is on Mars, musing about times past and time in the future (as he is a time-traveler that makes sense for him to do). It’s a complicated page, which may require a reader to re-read it quite a bit to understand it; and on a second or subsequent re-read, you may draw different conclusions from on your first reading. Likewise in a couple of other sessions (keynotes by Ian Gordon and by Woodrow Phoenix) there was mention made of re-reading of comics and the way you may understand them better, or as saying something different, on re-read. That led me off on a separate train of thought – I wonder if comics are a kind of item that historically has been re-read more than other kinds of things? I mean, obviously people do re-watch TV and film multiple times (though for TV that had to wait until video recording was invented for it to become a mass-market phenomenon). Many people re-read books multiple times (though in my experience there is a type of person that voraciously re-reads, and another type of person who may be a great reader but never re-reads). But perhaps comics are a slightly peculiar case where it was always very normal, or expected, to re-read them? 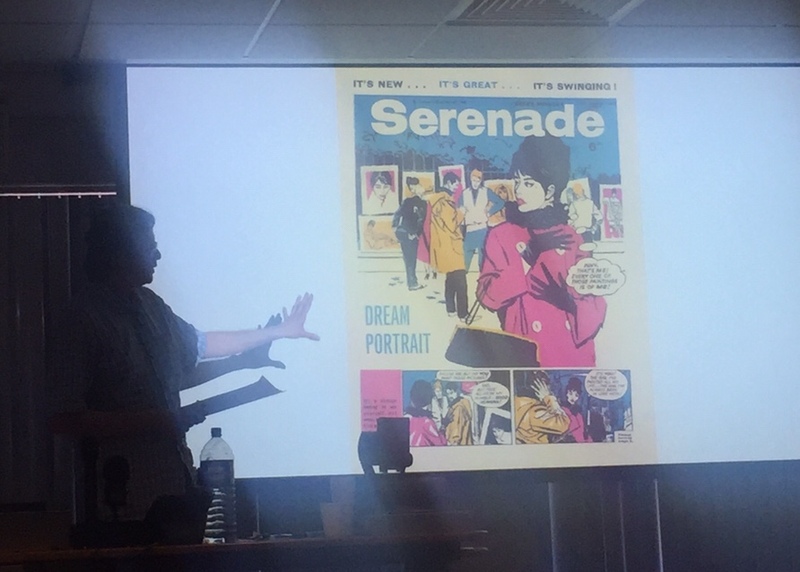 In a talk that Joan Ormrod gave in Oxford earlier this year, she looked at weekly comics aimed at a teenage audience in the 50s (Roxy / Mirabelle and the like) and she highlighted the fact that when these came out, there was little in the reader’s life that was a permanent, accessible object that told them about the music of the time. The other ways they had of learning about what’s what in music was to listen to a program that was only broadcast once or twice a week – all the other ways they had of being a music fan, or a pop culture fan, were so ephemeral that most of the time you had nothing but your memories to go on. The comics, in contrast, were right there with you, ready to be re-read (and lent out to friends, and re-circulated). And as so many of the stories were serialised, did the readers make a normal practice (as I did) of going back and re-reading earlier episodes once the story came to an end, or of going back to the beginning of your whole pile and starting again with the satisfaction that you know what’s ahead of you? I’m not trying to say that comics are either necessarily something that people re-read by definition, or that all comics are re-read (either would be wide of the mark). But I can think of a few reasons why comics might go hand-in-hand with regular re-reading of them. 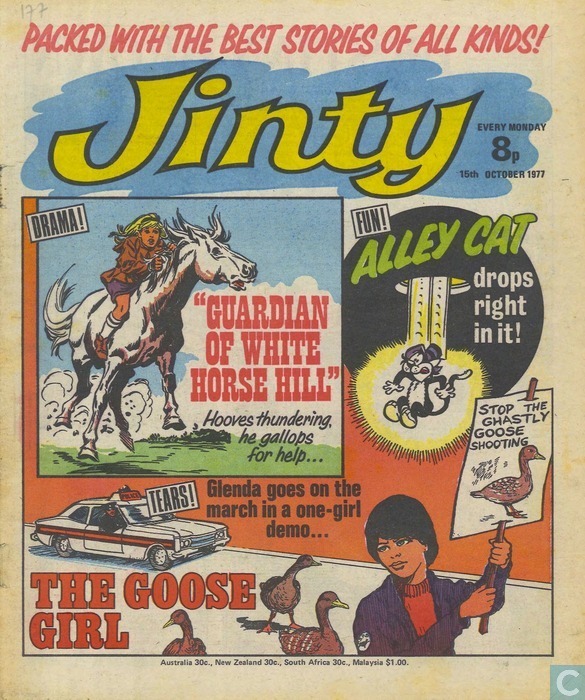 For one thing, comics have often been published as serials, in weekly episodes, which means that each weekly issue would have a fairly limited number of pages and stories included. As I say above I can see that in this situation the reader might read their new weekly issue and then either go back and re-read earlier issues, or perhaps say ‘aaargh! Too long to wait until next week!’ and turn to page 1 of the new issue and start re-reading there and then. A comic is also ‘the right sort of thing’ to be re-read easily. It’s delivered in a tangible format, not hard to store, and you don’t need any extra steps or equipment to be able to come back to it another time (unlike needing to have some sort of recording equipment to capture a broadcast). Of course you could give away your week’s issue, or chuck it away, but if you didn’t do that then they would be ready to hand as an obvious easy thing to pick up again later (and with an inviting cover to boot). Did readers typically throw comics away? 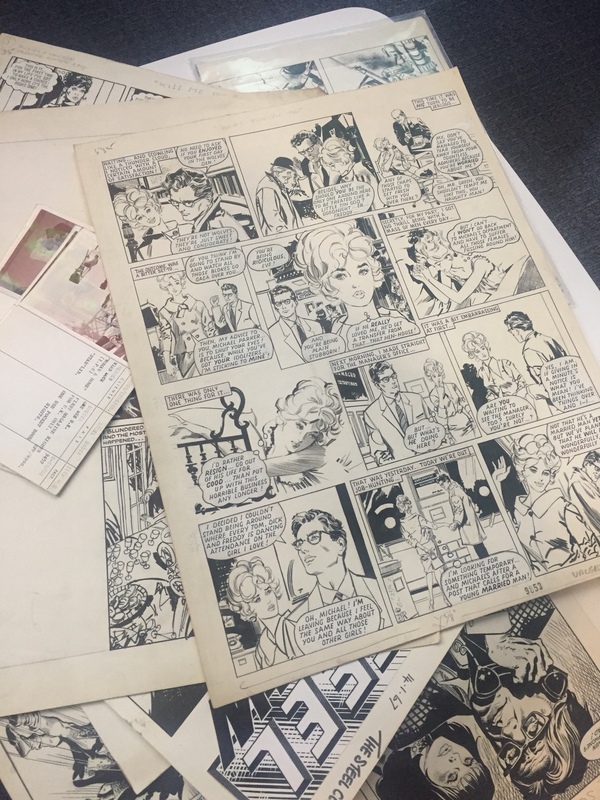 Of course some people will have done, but even the horror stories you hear about ‘my mum threw away my comics!’ are talking about comics collections kept for some time, and not instantly disposed of. We also heard quite a few stories at the conference of how hard it often was to get hold of one’s comics: Mel Gibson spoke about the lengthy bike rides she took as a kid, to make sure she covered all the various newsagents that stocked different titles. If they were often hard to get hold of, that’s going to make them feel more valuable right away. It’s not a necessary conclusion that they would be re-read frequently as a result, but it certainly all adds up to lots of plausible reasons why readers could or would often re-read. The above are fairly circumstantial and rooted in historical happenstance, and those are happenstances that will be subject to change. (For instance nowadays lots of people get their reading as digital comics or web comics, which are definitely not tangible or delivered in limited weekly doses, and not particularly hard to find and buy either.) There is one more aspect which is something potentially more directly linked to the nature of the medium: the fact that the words and the pictures can be read at different speeds and in different ways. You can read the words quickly, to find out ‘what happens next’ or to get the gag, but on re-read you have lots of extra enjoyment to dig out of the art. That’s two levels or two ways that you can read a comic on, right away: you don’t have to be an expert in textual analysis or Lacanian subtext to do that, it’s easily accessible, so to speak. So, built into what it is to be a comic, there is at least one reason that might drive people to re-read them as a matter of course. It also challenges the idea that I think a lot of non-comics readers would have, of comics as ephemeral. Clearly for the readers of this blog, they haven’t been ephemeral – but I think that nor were they ephemeral for the usual reader of the time, whether or not they went on to be life-long devotees. Comics were certainly re-read a lot – most of us reading this can bear witness to that – but I can also think of a few different reasons, as above, why they might generally have been re-read *more* than other things you wouldn’t think of as ephemeral.